Scot Landry hosts a recent episode of The Good Catholic Life radio program. Braintree – The Archdiocese of Boston announced August 29 that Scot Landry, Secretary for Catholic Media and President and CEO of iCatholic Media, will leave his current duties to become Executive Director of Catholic Voices USA, a national apostolate that seeks to prepare lay Catholics to articulate, share and defend the Catholic faith. Landry, who has been with the archdiocese’s Central Ministries since 2006, will transition to his new position in September. He will continue to assist Cardinal Sean as a Consultant, write columns for The Pilot, and serve as one of the hosts of The Good Catholic Life radio program. “Scot has been generous in sharing his many gifts for the strengthening of the local Church here in the archdiocese. He has been particularly helpful in our efforts regarding evangelization. I hope his new endeavors, which will build on his abilities in media and evangelization, will bring him much happiness,” he added. “It remains one of the biggest honors of my life to have been asked by Cardinal Seán seven years ago to assist him and so many others in leadership positions for the Archdiocese of Boston to renew the Catholic Church here,” said Mr. Landry. Landry joined the archdiocese in 2006 as Secretary for Institutional Advancement. In that role, he oversaw an increase of financial support to the Central Ministries of the Archdiocese of Boston through the Catholic Appeal each year, implemented new training programs on stewardship and fundraising for parish leaders and was instrumental in the Improved Financial Relationship Model. In 2008, as part of a reorganization of the archdiocese’s Central Ministries, Landry also became responsible for overseeing the archdiocese’s media organizations – The Pilot, CatholicTV, and archdiocesan websites and new media. Given the rapid growth in media and because of his commitment to the New Evangelization, Cardinal Seán moved to establish a new Secretariat for Catholic Media in July 2010 and named Mr. Landry its first Cabinet Secretary. Among his accomplishments in that role, Landry established Pilot Bulletins and Pilot Printing, he helped bring Catholic Radio station WQOM to the archdiocese, he launched and hosted a live local daily program on Catholic radio called “The Good Catholic Life,” he led archdiocesan efforts to utilize Social Media for communication and evangelization, he led the revision of the Pilot Catholic Directory of the Archdiocese of Boston, and he worked with leaders of The Pilot newspaper and CatholicTV to strengthen those critical ministries. Landry was part of the team that managed and led many important Archdiocesan initiatives during his tenure, such as Catholics Come Home, The Light is on for You, the educational campaign to prevent assisted suicide in the Commonwealth of Massachusetts, the organization of 3,000 Boston-area participants at the 2008 Papal Mass at Yankee Stadium, and coverage of the 2013 Papal Conclave from Rome. Landry is a graduate of Harvard Business School and Harvard College. Originally from Lowell, MA he resides with his wife and children in Belmont, MA. Cardinal O’Malley will begin a process, working with Sr. Marian Batho, chair of the iCatholic Media Board of Trustees, to determine roles and responsibilities related to the leadership of the iCatholic Media Corporation. As President of the CatholicTV Network, Father Robert Reed will continue to run CatholicTV operations. As President of the Pilot Media Group, Mr. Antonio Enrique will continue to guide the ministries of The Pilot Newspaper, Pilot Catholic Directory, Pilot Bulletins, Pilot Printing and Pilot New Media. BRAINTREE — It was announced Aug. 29 that Scot Landry will be leaving his position as Cabinet Secretary for Catholic Media of the Archdiocese of Boston to become head of the organization Catholic Voices USA. Following is an edited version of Landry’s written responses to questions about his decision to accept his new position as well as his reflections on his seven years of service at the archdiocese’s Central Ministries. You are leaving your current duties to lead the national apostolate, Catholic Voices USA. What attracted you to that new role? Catholic Voices USA was founded in 2012 and I’ve been a strong supporter since I first heard mention of it from my brother, Father Roger Landry, who was asked to serve as its national chaplain. I attended their first training in Washington D.C. and then worked with Catholic Voices USA to offer a training weekend to Boston-area Catholics this past April. I think Catholic Voices meets a huge need in the Church for lay people to become articulate, well-catechized and media-ready communicators, particularly on hot-button issues. Often, when non-Catholic media organizations seek out representative or average Catholics to comment on an issue, they often find media-trained individuals who sometimes have an agenda that isn’t always faithful to Church teaching. That leads people astray. That problem has always bothered me and I have always felt the desire to do something about it. The good news is that we have many well-catechized lay Catholics who love the Church and have the authority of direct lived experience. They simply need some media training to be comfortable and effective sharing, explaining and defending the Catholic faith particularly in the media. Training these individuals is the main purpose of Catholic Voices. Was it a difficult decision to leave full-time service at the archdiocese’s central ministries? Certainly. It has been a joyful privilege to serve the Church in the Archdiocese and to assist Cardinal Sean as the Secretary for Institutional Advancement and then the first Secretary for Catholic Media. My colleagues here at the Pastoral Center are inspirational to me and I’m honored to call them my friends and to pray alongside them at Mass. That is the toughest part about this decision — knowing that I won’t be in the company on a daily basis with the people I have been working with over the past seven years at the Pastoral Center as well as the many priests, parish staff leaders, and agency directors with whom I have had to work closely. I’m glad that I will have the opportunity to see people occasionally as I continue as a part-time consultant to Cardinal Sean, write columns for the Pilot and continue to serve as one of the hosts of The Good Catholic Life whenever my schedule allows it. What have been the personal highlights of your seven years here in Central Ministries? It will probably sound corny, but the main highlights are all the friendships I’ve been blessed to build with thousands of people who are working for the Church as priests, religious, and lay staff members here in Braintree, in our parishes, schools and ministries and who serve on our boards and other important committees. The Catholic Church is a family and it has been great to work together with so many individuals to advance our family’s mission to transform the world, one soul at a time, and to build a civilization of love. Secondly, it’s been a true honor to assist Cardinal Sean directly on so many initiatives close to his heart. He has a heart for evangelization and to reach all people who are lost, forgotten and on the fringes of society. He is very much like Pope Francis in that regard as they both model their leadership on the great St. Francis. Work highlights as the Secretary for Institutional Advancement are that together with our great team, our pastors advisory committee, our lay committees and with parish staff leaders, we were able to increase the Catholic Appeal proceeds each year and collectively achieve our annual goals. We were also able to meet Cardinal Sean’s objective to help parishes increase their own fundraising and to help parishioners support the Church through new solutions like online giving. It was an honor to help form the Improved Financial Relationship Committee and see the Improved Financial Relationship Model implemented and observe how it is providing more financial resources for the majority of the parishes enrolled in it. The best part of my time in development, however, was clearly being able to have a front-row seat to the tremendous generosity of so many Catholics who love the Church. Generosity and selflessness in action are so very inspirational. In terms of Catholic Media, Cardinal Sean asked me in 2010 to help continue the positive trajectories of The Pilot and CatholicTV, add a bulletin company to improve weekly parish communications, launch a Catholic radio presence in the Archdiocese of Boston, and to enhance both archdiocesan and parish websites and social media. I’m happy to report that all of these objectives were accomplished and that the great team in Catholic Media will ensure they continue. Finally, people who know me well are aware that I love to work on initiatives and new projects. We’ve had so many ones in the archdiocese over my seven years — everything from organizing thousands to go to Yankee Stadium for the Mass with Pope Benedict, to working on the team that moved the archdiocese from Brighton to Braintree, to the IFRM, to the victory on Question 2 last year, to the launch of Catholics Come Home and The Light Is On For You, to the introduction of Catholic radio 1060AM and The Good Catholic Life program, to the new ministries of parish bulletins and Church printing. Cardinal Sean has been a bold leader so we’ve had plenty of great projects on which to work! Are there any things you hoped to do that you haven’t, or any regrets? Yes. I had hoped by now that we would have a second major Catholic radio station in the Boston area, one that would focus on Spanish-language and Portuguese-language programming. We need one desperately to connect many recent immigrants to the life of the Church and to provide great catechesis. I hope we as a Catholic community can achieve this goal in the near future. Another regret is that we needed to suspend the Boston Catholic Men’s and Women’s Conferences after the 2010 conferences and we haven’t been able to bring them back yet. It was a struggle to balance my day job in central ministries with the apostolate of Boston Catholic Conferences. I’m hoping that in 2014 we are able to bring back the conferences. We need apostolates, such as Boston Catholic Conferences — as well as Catholic Voices — to complement the work of our central ministries and our parishes to have a fully vibrant local Church. What will you be doing in your part-time role as a consultant to Cardinal Sean? I think the majority of the projects will involve evangelization in some way. Cardinal Sean has a heart for evangelization and many great ideas for new approaches to reach those who are currently not connected with the Church or whose connection could be deepened. He’s also requested my help over the past seven years with research on issues or questions, so I think there will likely also be research projects. He may also want my help in some way as we try to reach the goal of a radio station for Spanish-speakers and Portuguese-speakers. We’ll see. You played a role in launching The Good Catholic Life radio program. Do you anticipate having any future role with it? First of all, it was Cardinal Sean’s idea originally to work with WQOM to launch this daily local program that has become an important part of the archdiocese’s evangelization and communication platforms. Being one of the cohosts has been a huge blessing to me. Beyond getting to build friendships with our guests and all those involved with the program, it has helped me learn so much more about our faith as I prepare for each show. I’ve let Cardinal Sean know that I’m happy to continue as a volunteer cohost of the show whenever I am available and not traveling in my new role at Catholic Voices. For those times when I’m not available, one of our fantastic cohosts or our great producer Dom Bettinelli will step into the moderator’s role. We have a deep bench of people already involved in the program and several others who have expressed interest in helping out. 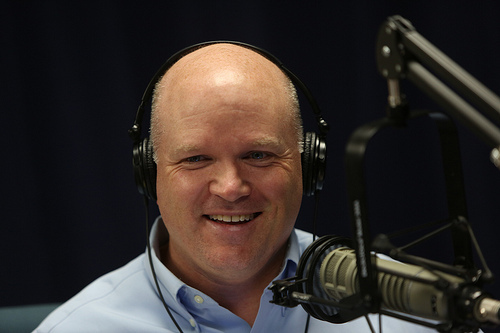 I look forward to connecting regularly with Pilot readers through my columns and radio listeners through The Good Catholic Life.